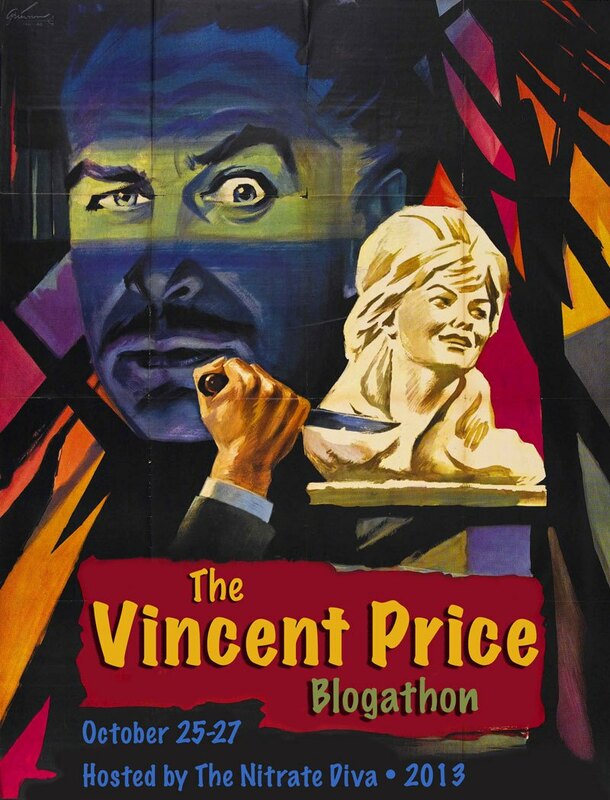 This article on The Tomb of Ligeia is the SBBN entry for Nitrate Diva’s fantabulous Vincent Price Blogathon, held October 25 through 27th. Check out all the terrific entries! It is a clear, cold day in the early winter of 1838, and Verden Fell, current owner of the Castle Acre Priory, an astonishing 11th century monastery, is burying his beautiful young wife Ligeia. Verden (Vincent Price) tells the few assembled of his wife’s extraordinary beliefs: that mankind can shake off the shackles of the Christian God and embrace the Egyptian idols, and return from the dead. Ligeia (Elizabeth Shepherd) is not meant to be buried in consecrated ground for her sins, but Verden defies tradition and the church, and remains fully committed to the idea of her secular resurrection. After all the humans leave, a black cat watches over Ligeia’s grave. Nearly a year passes since her death when the spunky Lady Rowena Trevanion (also Elizabeth Shepherd) finds herself, after a fox hunt, amidst the beautiful ruins of the ancient abbey. She is thrown from her horse and lands directly atop Ligeia’s grave, briefly knocked out. Rousing herself from the garden of wild red asphodelus atop the tomb, Rowena sees the sleek black cat, still guarding the tombstone, but is shocked into a faint at the sudden appearance of Verden, so ashen his skin is the color of bone, and in dark glasses to ward his delicate eyes from the light. In the real world, we’d say Verden was suffering from photophobia, but in the hands of screenwriter Robert Towne, Verden’s physical inability to withstand light in The Tomb of Ligeia (1964) is due to one of those peculiarly vague Victorian ailments, psychological and physiological all at once, an indicator more of what troubles his heart than affects his eyes. Because Verden has the mien of a tortured soul, the strong, willful Rowena is immediately attracted to him, just as Catherine is drawn to Heathcliff in Wuthering Heights, just as so many other women in Victorian literature see the good inside what appears to be a vile man. These women were often the products of female authors, and their strength and courage and insight were focused entirely on revealing the exceptional man underneath a rough, violent exterior. In Poe’s Ligeia, we see the other side of this equation, the man who knows his moodiness and temper have driven Rowena away, and who is happy about it. The power he feels from this hostility is palpable, and a direct reaction to the loss of his first lady love, Ligeia. Verden — a name not used in the original story, but probably a slant reference to the “verdant decay” Poe describes of the abbey — is almost entirely the creation of Robert Towne, who chose to rely on easily-recognizable Victorian era literary tropes and combine them with Poe’s otherworldly narrative. The effect is quite strong, actually, though it’s questionable how faithful it is to Poe’s intent. The screenplay necessarily had to add more content, as the story is so short, but many of the elements within the story, such as the fitful resurrection of Rowena after a long illness, are used as a basis of larger plot points in the film. Verden has a more subdued affect than the narrator of Poe’s story, a constant simmering of anger and confusion just under his pale, clammy skin, while Rowena is completely unflappable in a mildly irritating way. After the black cat attacks her repeatedly and all manner of strange things happen within the abbey, and even after Verden confesses his concern over his mental state to their mutual friend Christopher (John Westbrook), she marries Verden anyway. After a lengthy honeymoon, they return to the abbey, which Verden now wants to sell, but upon his return he immediately becomes cold and distant. 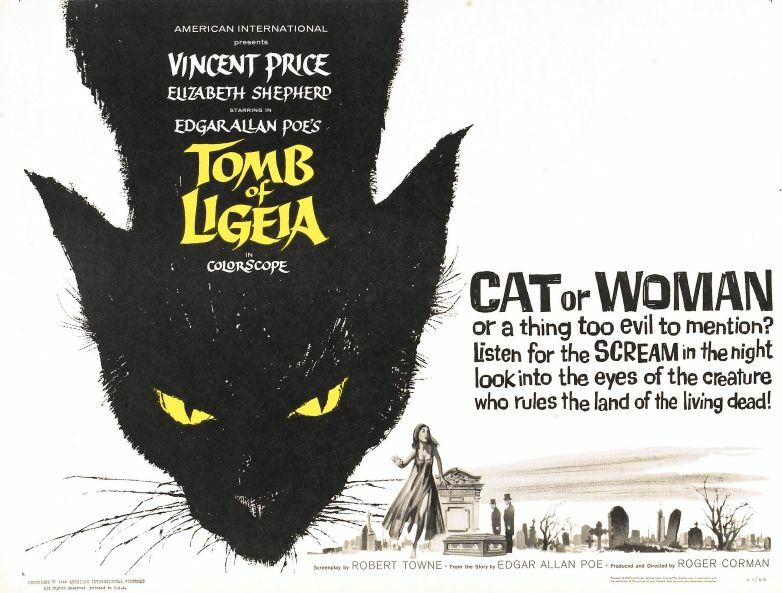 The cat skulks about, Christopher becomes convinced Ligeia is alive and hiding somewhere in the abbey, Rowena begins to channel Ligeia, and there is no doubt that the situation will escalate into complete and utter disaster. A series of wonderful paintings by Francis Rodker grace the opening credits and title page. I’ve posted the whole series on Tumblr here. SAY this for Roger Corman, the young director-producer of the Edgar Allan Poe adaptations starring Vincent Price. Mr. Corman at least cares about putting Mr. Poe—or at least some of the master’s original ideas—on the screen. …probably not too much Poe, although we have not read the original. While The Tomb of Ligeia is unquestionably one of Roger Corman’s best Poe adaptations, stylish and intense and compelling, it also possesses one of the weakest endings of any of the Corman-Poe films. This sickness and death and return to life of Rowena-Ligeia in the short story is mirrored in a cinematic finale which sees characters arrive into a cursed death chamber, then leave, then return again, then leave again, while Verden flips his attentions randomly between the corpse of Ligeia and the corpse of Rowena. The end result is that boring confusion so common to B movies, a jumble of important moments and dull extraneous bits, all inadvertently presented with the same intensity, making it difficult to extract any meaning from what is on the screen. Some of this confusion comes from the complex nature of the Rowena-Ligeia character. Once the Lady Rowena awakens atop Ligeia’s tomb, she is occasionally, temporarily possessed by Ligeia. These switches between possession and Rowena regaining control of herself happened so quickly within the film that Roger Corman wrote down a chart on the back of his script during filming, yet still found himself during at least one scene having to shout, “Cut!” and take a moment to get it all straight in his head. By the finale, when Rowena comes into the chamber and finds Ligeia’s corpse, while the sinister cat dashes about and we in the audience can’t be sure whether we’re seeing Verden’s visions or reality, it’s so hopelessly muddled we have to just let it ride and hope for the best. Despite the confusion, the first two acts of the film are exceptional, and even during the unnecessarily complicated finale, there are moments, such as when Rowena ends up entangled within the stiff dead arms of Ligeia, or when the black cat hops up a moment after being killed as though nothing has happened, which are exceptional. And it all ends with the abbey burning spectacularly as Verden and that accursed black feline finally have that psychosexual showdown they’ve been postponing for the last 90 minutes. Roger Corman, who had been fond of the works of Edgar Allan Poe as a child, had done seven cinematic adaptations of Poe, all starring Vincent Price, and went into Ligeia knowing it would be his eighth and last. There was some talk of another Poe adaptation, but Corman felt these “late wife movies,” as he and the crew jokingly referred to them, had run their course. He enjoyed Ligeia but in interviews seems reserved when extending praise, though Vincent Price often listed Tomb of Ligeia as his favorite; if not Ligeia, then Masque of the Red Death. Unlike so much of Corman’s other low-budget fare, The Tomb of Ligeia engages the viewer on every level. The visuals are stunning, the sets decadent but not overdone, and the psychosexual imagery comparatively subtle and always compelling. While influenced by Hammer Horror, Ligeia itself became influential, even to this day, with films like Dark Shadows (2012) borrowing everything from set design right down to Price’s iconic look. Vincent Price’s commitment to the genre coupled with Corman’s obvious taste for the subject matter in such a way that their Poe collaborations, even the lesser ones, were fascinating. Tomb of Ligeia is beyond fascinating; it is an unquestioned masterpiece, the quintessential example of what B-movie horror films could achieve. I enjoyed your thoughtful post, especially your comparison of the Rowena character with the strong women of 19th-century fiction; it’s a dimension of the film that, while maybe not consciously part of its context, adds to it. I remember when seeing the film how interesting and mature the Rowena-Verden relationship seemed; they behaved like two intelligent lovers (who could TALK to each other) and not like giddy teenagers or the conventional mystery man/scared wife scenario.. And I think Price’s age helped also to convey that, much more than if the callow Chamberlain had been used. A younger couple would have been a completely different movie, it’s true. Chamberlain might have been able to pull it off, too, though recalling his performance in Petulia he may just not have been experienced enough to be a convincing Verden even if the character WAS intended to be a generation younger. Very good! I haven’t watched this film yet, but I enjoyed your review a lot. Thompson’s review is very curious, I’ve never seen a critic like this!